You might have seen the magnetic clip on camera lenses for the iPhone 5 that lets you take your iPhoneography to the next level. You might have also seen the iPhone tripods that allows for some crisp and clear photos. Then there's the portable charging cases that we've all come to know too well. However, that was three separate products I just named off. ZOpro takes all three of those things and combines them to create an extremely versatile and lightweight case that could just be the next best thing. Starting with the charging function, the ZOpro cleverly hides a small USB connector within the case so all you do is slip the bottom end off and plug it right in to your computer. This gets rid of the hassle of bringing along those long and tangly cords we all could get along without. As for the tripod, it comes with a magnetic piece that holds your iPhone in place for easy access in case you get a message or call during your shoot. It will attach to most tripods without a problem. There are countless other accessories that are compatible with the ZOpro such as a kickstand, dash mount, and removable handle that could all come in handy during your daily routines. The magnetic camera lenses prove to be quite the hot item now that iPhonegraphy has extended past the daily Instagram pic of your latest meal. 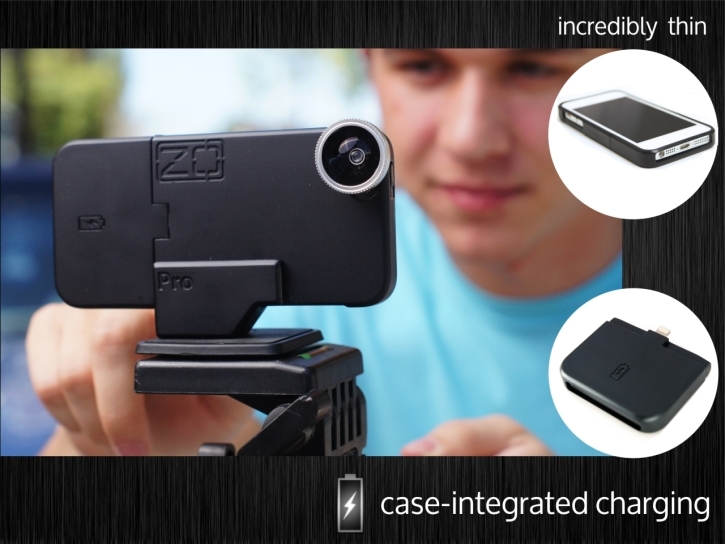 ZOpro features a rapid magnetic lens that simply grabs onto the ZOpro case and is ready to shoot. There are lenses for macro, fisheye, and wide angle photos. For a little bit extra, ZOpro will throw in an olloclip compatible accessory. As with most awesome ideas that come our way, a lot of them are from Kickstarter. This is no different. Head on over to their Kickstarter page and help to bring this genius idea to the market. Pledge rewards vary but the best of them are limited and are almost running out. The ZOpro is aiming for a January-February ship date and will be available for both the iPhone 4/S and the new iPhone 5. Head on past the break for a preview video.